44 years ago today, two American men were sitting inside a capsule landed on Earth's only natural satellite-the Moon. I can only imagine how stressful that next 21 hours was as Neil Armstrong and Buzz Aldrin stepped out of "The Eagle" just hours after landing, collecting samples and taking photos that amazed the world. And did I mention they did this on THE MOON? Apollo 11 was a true example of moonshot thinking. It set records, allowed for more space research, effectively ended the Space Race, and inspired millions of people to pursue science. (I think I might still have a Neil Armstrong moonsuit I made for a speech about him in 3rd grade.) We need to thank all the scientists, engineers, politicians, and, of course the three astronauts that spend 8 days on the journey. They showed that hard work can help reach what may seem like an unobtainable goal. It seems that you have found my blog. Congratulations! This is a brand new site for all things Nerf- from reviews to sneak peaks to fun games to play, this is the source. Never heard about Nerf? Let me introduce you. Nerf was a company started in 1969 by the Parker Brothers. It stands for Non Expanding Recreational Foam. Currently, the company is owned by Hasbro. They made dart guns, foam swords, and foam balls. Thanks for coming here- your place for all things Nerf. I continued quite often posting through that October, and in December I wrote this post, announcing that What's That? Nerf was to be no more. My return to content creation was in 2012 on my YouTube channel, as in June I had 3 weeks of DougASchu Vlogs- daily videos on technology, Nerf, and weather. After a while, the workload no longer fit into my schedule...and I had to stop. Later on after my last video, I stumbled upon my old blog while looking though my Google products. To my surprise I had racked up over 3,00 pageviews. That number alone, along with my seeking for a new medium for DougASchu Vlogs, convinced me that blogging was the way to go. So, after a URL, name, and content change, DougASchu Blogs was born. But...it just didn't work out. Before I knew it, summer was gone and I just could not run a blog decently. That brings us to this year. As the school year was winding down, I knew I wanted to start creating videos again. However, my experience in 2012 taught me that straight vlogging or blogging was not going to cut it. 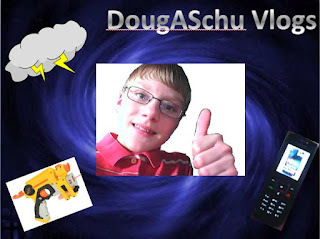 As my friend +Wyatt Dohrwardt designed a vlogging logo for me, he added my old blogging URL to it...which brought to my mind the idea of Operation Storm, my cross-platform content creation schedule that involved technology (including gaming), weather, and life-related postings on YouTube, Twitch, and right here...Douglas Blogs. It hasn't always been timely (ahem, like this last week, but I'll get to that later) or pretty, but Operation Storm has been a great way for me to show my interests to the rest of the world. As long as I am enjoying it, and others care about it, I'm happy with what I've done. (Almost) 2,000 video views on YouTube, gaining 19 subscribers. Countless Google+ posts and Hangouts, amassing 95 circlers. 158 tweets, making 35 followers. Multiple Twitch livestreams, showing 3 followers. I'm glad to know that people are involved with my online projects, and I would like to thank you for the support. Douglas Blogs (as part of Operation Storm), will continue through the rest of the summer, and I hope you join me though then and beyond. As the near future goes, I'm taking a content "vacation" though Monday the 28th as I NEED to get some other stuff (like 4-H) done. But there's one exception...next Wednesday (the 24th), as Google is hosting a major event at 11am CST in San Francisco. I'll be liveblogging at that time from the comfort of my computer here in Wisconsin as we (expect) to see the next version of Android and the future of the Nexus device line. As Google likes to say, maybe we'll see a new moonshot project. (YES, I knew I would tie this together!) I'll see you right back here Wednesday morning for that...or otherwise it'll be another week. Thanks for reading today's [very long] post!